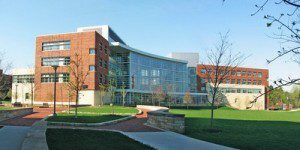 The Penn State Executive MBA program at Smeal College of Business admits a new class of students each August and typically spans 21 months, although students can complete the program in as little as 17 months. The program has four “segments” that roughly correspond to traditional fall and spring semesters and also includes two residency weeks at University Park and a Global Immersion Week. Classes occur on alternating weekends and run from 1:30 p.m. until 5:45 p.m. on Fridays and from 8 a.m. until 5:15 p.m. on Saturdays. Students are required to stay overnight at the Chubb Conference Center on class weekends. The Penn State Executive MBA first-year core curriculum comprises 14 courses that focus on three fundamentals of business: principled leadership, strategic analysis, and financial management. These fundamentals are then capped with a strategic assessment project, in which students create a systematic analysis of a firm, which allows them to make recommendations to a company and to hone their presentation skills. Students then take the Leadership Core in their second year, a series of courses that are designed to teach the skills needed to earn a promotion or to become an executive within their firms. At the end of the program, students visit another economic region during Global Immersion Week. These trips have been held in Singapore, Brazil, Chile, Ireland, China, Turkey, India, and Japan, and give students the opportunity to interact with business leaders and government officials and to visit both local and multinational firms. Orientation for the program begins in July. The average age of students in the Smeal College of Business Executive MBA program for the Class of 2019 is 37. About 34 percent of the class identifies as female, with 66 percent male students. Roughly 17 percent of those students come from outside the U.S. Typically, students in the program have an average of 13 years of previous work experience. Around 20 percent join the program having previously earned a different graduate degree. The Penn State Executive MBA tuition currently is $102,000, which covers tuition, textbooks, basic supplies, required course software, and all meals and lodging for overnight stays at the Chubb Conference Center, the two residence weeks at the University Park campus, and the Global Immersion Experience. Penn State Smeal offers a limited number of scholarships, which can range up to $10,000, to students who submit an additional essay with their application explaining why they are deserving and why they are in need of help. The deadline to apply for these scholarships is January 15. Students in the EMBA program are eligible for the federal Stafford Loan program, which provides up to $20,500 a year in aid, and for federal graduate PLUS loans. Also available to students who have completed a Penn State University Degree is the Alumni Award. This $5,000 scholarship is one time only and will be applied to EMBA tuition. Armed forces veterans may waive the application fee, and are eligible for funding under the Yellow Ribbon Program and the Post 9/11 GI Bill. Penn State Executive MBA candidates must have six years of work experience as well as managerial or team leader experience. Applicants with fewer years of work or managerial experience who have a sponsorship letter from their firm will be considered. While applicants are not required to take the GMAT before applying to Smeal, the Admissions Committee may ask certain applicants to take the GMAT. Applicants must submit a completed online pre-assessment form that asks for basic personal, academic, and professional information; a current résumé; two recommendations; original transcripts of all undergraduate and graduate coursework; and two one-page essays, one of which concerns integrity while the other asks about the applicant’s short- and long-term goals. Qualified candidates are invited and are required to complete a personal interview with the Director of Admissions as part of the application process. Applications are reviewed on a rolling admissions basis.